Direct from NBC Studio D in Hollywood, California, Groucho Marx discusses gas prices and private enterprise with one of his You Bet Your Life guests, a self-made San Fernando Valley petroleum distributor and part-time USC "salesmanship" instructor named Kent Moore. 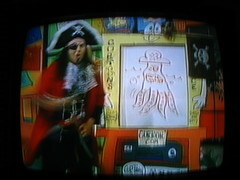 I woke up with the TV on this Saturday morning and was momentarily disoriented -- I'd fallen asleep to the persuasive drone of a Pilates-ball infomercial, and when I opened my eyes again there was a screaming cartoon squid who had recently escaped the Sharpie of a swarthy live-action pirate. Following the URL in the frame, I learned that the show, It's Curtoon Time, is in the regular rotation on South Orange County's Cox Communications - Channel 3, shoots out of Rancho Santa Margarita, and has been on since 1987. 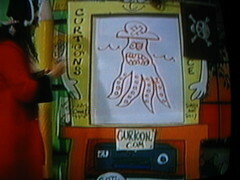 The "Curt" is cartoonist Curt Visca, who wears outrageous costumes and teaches kids how to draw, in a Pee-Wee's Playhouse-like setting. I know I'm a newbie to these shores, but I've long been familiar with Southern California's local TV legends (Huell Howser, Cal Worthington, etc. ), and this one caught me by surprise. Is he a legend, or just some crackpot who won't give up? And speaking of Cal Worthington: a couple of weeks ago, I spotted him in a 1973 film called Save the Tiger. 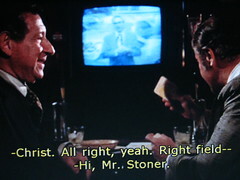 Here he is, flickering in the background on a bar's television while Jack Gilford and Jack Lemmon talk business (and baseball). In the movie, Gilford and Lemmon are aging Los Angeles garment-industry bosses arranging to burn down one of their factories in the hope that the insurance payout will help them meet their annual budget.